Or…in this case, cinematic architecture. Jonathan Rennie presented a project yesterday that I found most fitting in the vein of design fiction / architecture fiction. For the studio class run by Geoff Manaugh (@bldgblog) called Cinema City, a graduate studio that starts with this brief and asks the students to consider what they may. There were some interesting projects. This one in particular stood out for me. It was an unconventional approach in an architecture class to present a series of fictions about the future of cinema. This project explores a particular narrative for the future of cinema and, in turn, it proposes new possibilities for the moving image and its place, content, viewers & screen. A shift in content to QR coded cinema is predicted and, in turn..
** A future point where non-narrative images are viewed by post-human machine optics is proposed, with screens affecting the fabric of the city. The project is a sneak preview for a future of cinema, proposing a continuous cinema that is freed from both the spatial confines of the movie house and the literary expectations of narrative — told by and to non-human machines. In the first proposal, guerilla film distribution is done by throwing film grenades, a “weapon” first proposed by the Soviets and designed to be surreptitiously deployed during the Olympics. The weapons are found again by Jonathan during his project research, including documentation and some diagrams describing the clandestine Soviet project. 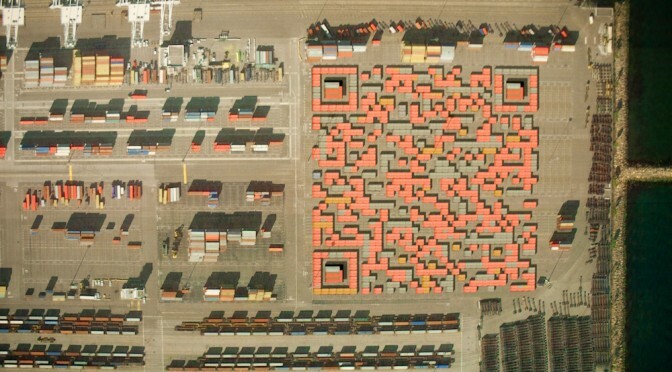 In the second proposal, Skynet — an extraterrestrial orbital satellite platform — finds QR codes in the landscape of earth. 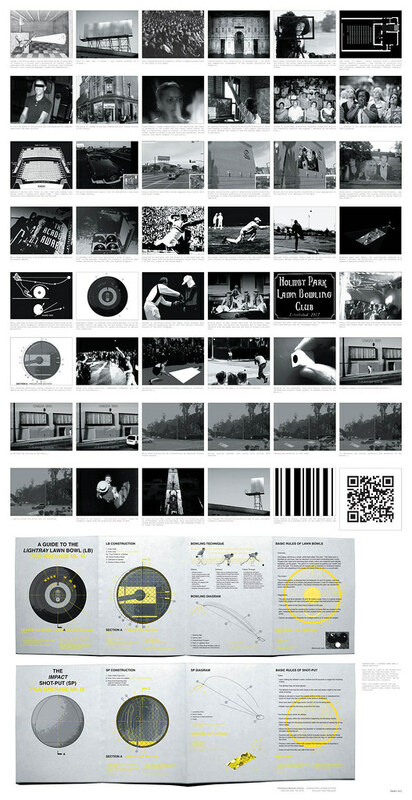 The QR codes embed stories and films that the satellites share with one another. 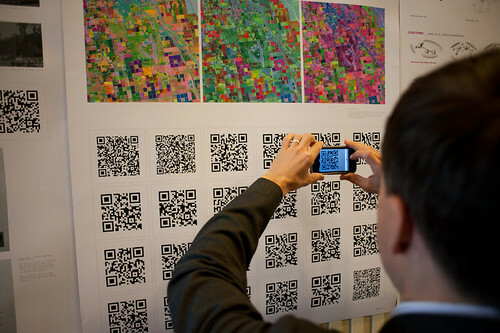 Over time, as they see the same films over and over again and become bored — they begin to look for QR codes elsewhere, perhaps interpreting barcode-like structures in the landscape at different wavelengths — for instance an infrared folliage rendering may appear to contain QR codes. They seek out new films in this way, perhaps even instructing terrestrial machines, such as the cranes at loading docks or tractors in large farm fields, to construct new QR codes containing new cinema and stories. Why do I blog this? This is one of those architecture projects that plays at the far end of the spectrum of architecture’s inherent speculative nature. The spectrum runs from the pragmatic *planning what will be* (traditional floor-plan stuff) all the way across to *speculating to help think* (architecture fiction), with *proposing (cardboard models, photoshop site renderings, camera-tracked little films showing the space as it would be) somewhere in the middle. I enjoy considering the spectrum of realizations as things move from idea to their material form. 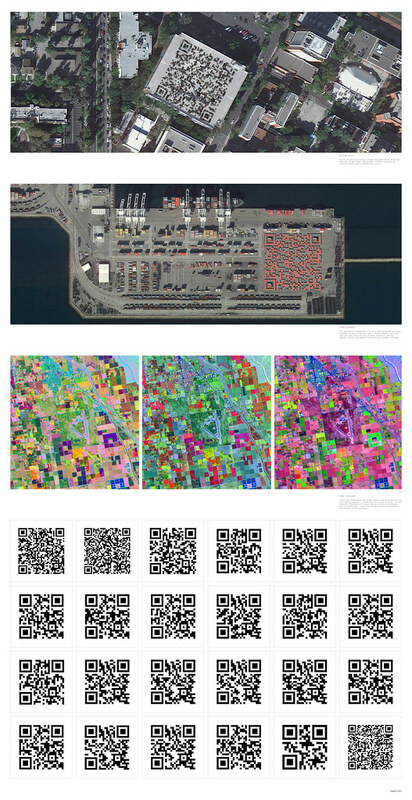 In this case, Jonathan has used the architectural brief to propose a speculation about machines reading the landscape to interpret meaning, or to watch movies that are referred to by the QR codes they (think?) they see. 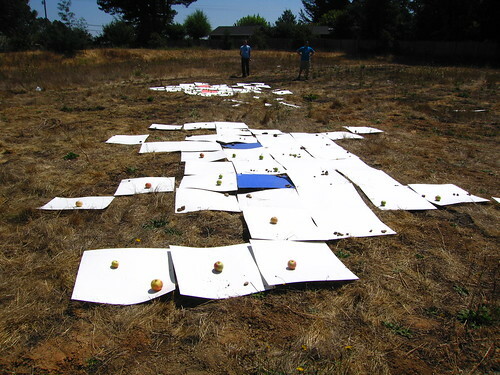 This is using the landscape as an interface, which I find super intriguing. Space Invaders upper right..Cylon Raider bottom left. Geoff has the more lucid discussion of this point, but suppose cornice details became machine readable physical cuts and bumps that would represent some meaning for, say…Google Street View cars? I’m not saying this is entirely practical, but I could see a day when bold marks like this that are required to exist (for any number of reasons — local services to identify what building they are at definitively, etc.) on new structures. This then becomes turned into an aesthetic to make it more pleasing as a facade, and so on. In any case — Jonathan’s work certainly gives me things to think about in an entirely fun, imaginative way.